The Symmetries tab is at the heart of the tiling process. Understanding the different symmetries is necessary to have full control over the outcome of a tiling. The symmetry of the tiling is selected from the pull-down menu under the Symmetries tab (see above figure). There are three regular geometric shapes that can be replicated to cover a surface completely (without gaps or overlaps). These shapes are: triangles, rectangles (parallelograms), and hexagons. A complete set of tiling symmetries requires taking these shapes and adding rotations and reflections. It is known that there are 17 such tiling symmetries. (See: Wikipedia entry.) All 17 symmetries are included in the Inkscape Crea Cloni in Serie dialog. The symmetries are shown next. Tilings based on a rectangle tile (or 45-45-90 degree triangle). The outlined dark blue tile is the basic unit. 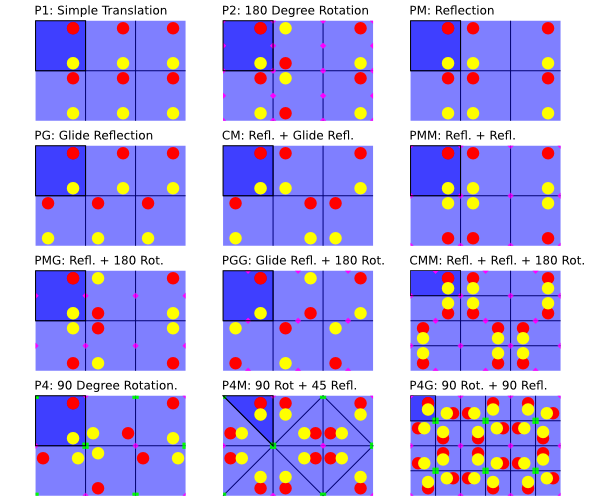 Red and yellow dots show the reflection and rotation symmetries. Points of two-fold and four-fold rotational symmetry are shown by pink diamonds and green squares, respectively. The P1 and P2 symmetries also work with parallelograms. Tiling based on regular subdivisions of a hexagonal. The outlined dark blue tile is the basic unit. All tiling have points of three-fold rotational symmetry (orange triangles). Two also have two-fold and six-fold rotational symmetries (pink diamonds and purple hexagons). The pairs of numbers indicate the row and column numbers. 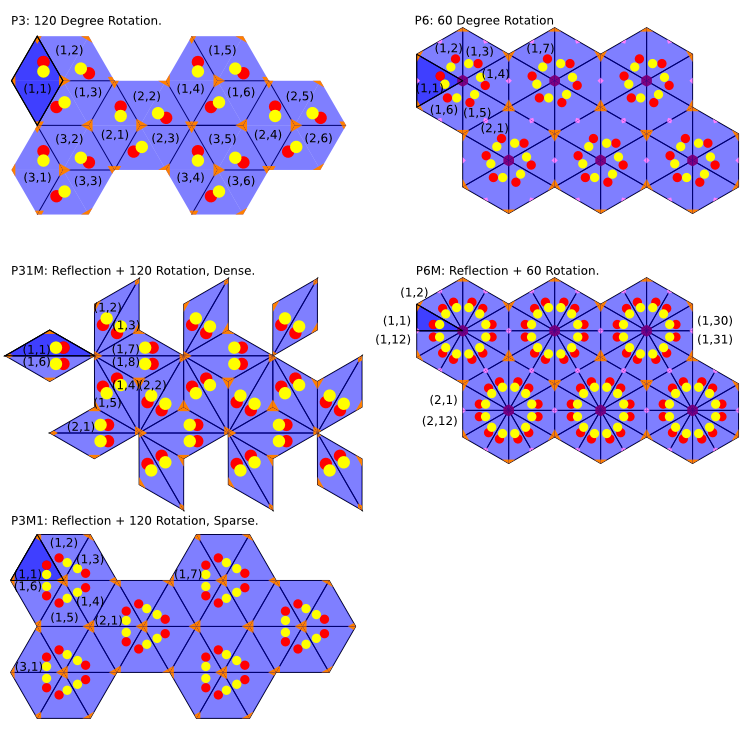 The basic tile for each of the 17 symmetries is shown in dark blue in the preceding figures. Inkscape uses the quadro delimitatore of an object to determine the basic tile size. For rectangular base tiles, the quadro delimitatore corresponds to the base tile. However, for triangular base tiles, the base tile covers only part of the quadro delimitatore area. This can result in tiles «overlapping» if an object extends outside the base tile shape (but is still within the quadro delimitatore) as in the tiling in the introduction to this chapter. Overlapping can also occur if the base tile is altered after the tiles are positioned. On the left is a triangle and circle that are grouped together. The triangle corresponds to the base tile for a P6M symmetry. Note that the red circle is outside the base triangle but is still within the quadro delimitatore of the group (and triangle). On the right is a P6M tiling with the triangle and circle. 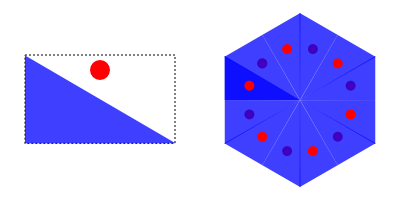 Note how the red circle ends up above some but below other triangles as determined by the order in which the tiling is made. As of v0.46, Inkscape always uses the Geometric quadro delimitatore to determine the tile size. This avoids problems when creating a triangular tile with a Contorno where the Visual quadro delimitatore doesn't have the same width to height ratio as the Geometric quadro delimitatore. If you need to adjust the base tile size after having creating a tiling, you can use the Editor XML dialog to change the parameters «inkscape:tile-h» and «inkscape:tile-w» (these will appear after you have cloned the object and are used only if the Use saved size and position of the tile button is checked).